Make this place your own. With award-winning dining and dorms, the perfect college town and 1,000 acres of natural beauty, there's a lot of ground to cover. But like any home, our campus is both a comfortable place to return to and a launchpad for exploring the world around you. Travel & Leisure calls it one of “America's best college towns.” We just call it home. In just a short walk from campus, students can be at the heart of a beautiful, bustling city bursting with coffeehouses, restaurants, galleries, parks, boutiques and nightlife. Famed for its many festivals and charming traditions, Saratoga Springs is an ideal location for creative thought to thrive. Plus it's only a short drive to the nearby Adirondacks, Berkshires and Green Mountains and just three hours from New York City, Boston and Montreal. Home is where you create it. 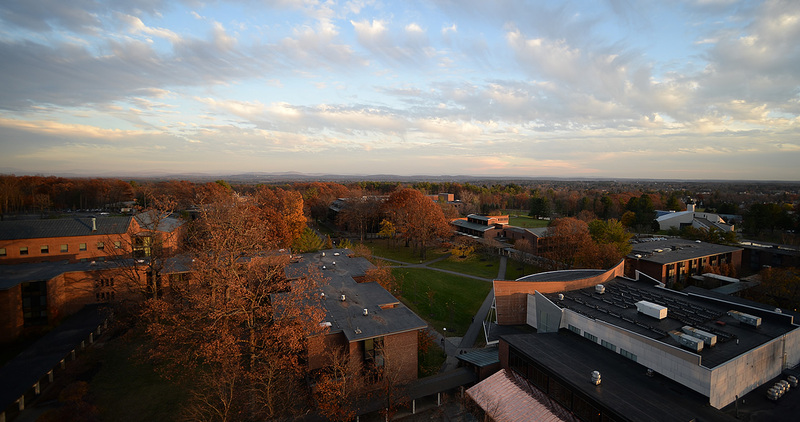 Skidmore's residence halls are among the best in the country. Actually, they're top 10, according to the Princeton Review. With the majority of students living a “suite” life or in our highly sought-after on-campus apartments, it's no wonder 94 percent of students choose to live on campus. To top it all off, Skidmore students eat well, too. Our award-winning chefs are always having fun whipping up the seventh-best college food in the U.S.
Green. More than our school color. Actions speak louder than words, and Skidmore's actions are loud and clear. What sets our sustainability efforts apart is that we do it on our own. No energy credits, no carbon offsets. From 29 buildings with geothermal heating and cooling to our own solar field to scores of student projects that target waste, energy, food, transportation and healthy living—being green is an active, ongoing commitment. Skidmore's Community Garden was inspired by our own students with support from the Sustainability Office. Located in the heart of campus, it supplies more than 1,000 pounds of organic food to our dining hall and the Saratoga Farmers Market. It also provides a venue for students interested in environmental issues, social justice and economic development to gain hands-on experience in the local food movement. "Saratoga Springs has all of the benefits of a city while being beautiful and peaceful. I love Northshire Bookstore and Uncommon Grounds. There are incredible career-learning opportunities like Saratoga Hospital and City Hall. And we’re close to the Adirondacks, which is perfect for weekend hikes!" "This might seem cliché, but it’s true. If you’re a student here, you know that our dining hall is pretty amazing." I love living in our on-campus apartments. They’re so nice my mom keeps telling me not to get my hopes up...I won’t have an apartment as nice as this for a while after graduation." Pick a major and learn more about our programs and success stories.